Electrical Ground Faults: Test all GFI outlets (ground fault interrupters) in kitchen, baths, etc. This task is important for safety reasons.If operating properly, circuit breakers and ground fault interrupters (GFI) will automatically trip when an appliance creates a short circuit.If they don't operate properly, a short circuit can potentially cause a fire. Testing circuit breakers and ground fault interrupters (GFI) help to ensure that they will operate properly when needed. NOTE: The tasks and timings shown here for your Electrical are based on a single-family home (owned), located in Massachusetts, United States, with priority set at ‘1 star' or higher, for all possible goals. If you set your personalization differently in your Home Wizard app, then you may get reminders for different tasks and timings in your recommended home care program for your Electrical. 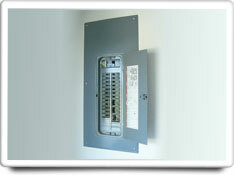 Circuit breakers are found the the metal electrical box typically found in a basement or closet (see the above picture on the right). You can test circuit breakers by switching from the "on" to the "off" position, and back again. If you have any questions about how to do this, then you should contact a professional. Ground fault interrupters (GFI) outlets are typically found where you have water near electrical outlets, for example in kitchens and bathrooms. You check the operation of all ground-fault circuit interrupter outlets by pushing the "test" button. The "reset" button should pop out, indicating the receptacle is operating properly. Press in the reset button when finished. The benefits of this task are relatively high. Doing this task helps ensure the safe operation of your home's electrical system. The cost of this task is very low. It is estimated that this task should only take about 30 minutes to complete, depending on how many circuits and GFI outlets you have in your home. No specialized tools are required.